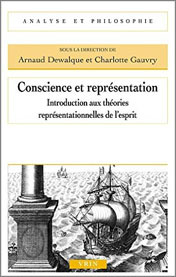 The collection of papers edited by Arnaud Dewalque and Charlotte Gauvry aims to give an insight into the broad landscape of representationalist theories of mind in contemporary philosophy, doing justice to its variety and richness. Besides providing a wide selection of texts belonging to the representationalist tradition, some examples of critical perspectives are also available. Thanks to this volume, pivotal works in philosophy of mind and perception are made available to a French audience, offering an extremely useful tool to non-English speakers who approach the Anglo-Saxon analytic tradition. More than an introduction to one of the most relevant issues in philosophy and one of the liveliest and most stimulating debates in these recent years, this book provides a thought-out perspective on representationalism, supported by very accurate references and a rich bibliography. The volume is organized into four sections, three of which contain the translations of several book chapters and papers, representative of three variants of representationalism put forward during the last 20 years. According to the proposed taxonomy – which is faithful to the historical and chronological development of this debate – such macro-perspectives are: (I) First Order Representationalism, (II) Higher Order Representationalism, and (III) Self-Representationalism. The concluding section (IV) is devoted to positions that are critical towards representationalism. The structure and richness of the volume is duly presented and supported by an Introduction where the editors trace the relationships between the different kinds of representationalism, both along an historical and a conceptual axis. Which is not an easy task, given the intersections that have characterized the debate so far. Since several reviews of the books from which the translated chapters are drawn are already available, this review will focus on the introductory section of the volume, so as to provide an exhaustive overview of the discussion, rather than a set of brief abstracts. The ongoing debate about the representational status of experience came recently to constitute a “new orthodoxy” in the philosophy of mind. The pivotal thesis of representationalist perspectives is that the human mind is essentially characterized by its capacity to represent objects or states of affairs as being in a certain way. The attempt to clarify the notion of consciousness in connection with this conception of the mind, brings the reader straight into the core of the debate: the complex relations between mind, intentionality and consciousness. And if the need for a satisfactory account of the qualitative aspects of experiences led by philosophers like Thomas Nagel and Franck Jackson to distinguish between first person and third person experiences, it also opens the door to reductivism and the so-called “mind-body problem” (8-13). The reference to this issue allows the editors to introduce one of the fundamental reasons animating representationalism, say, the attempt to preserve, by means of a descriptive approach, the qualitative aspect of experience from the reduction to its physical components. And it is precisely such a need that is believed to have been the impulse for representational theories to analyse consciousness and mental states in terms of representations and intentionality (14). The possible relations connecting what is mental to what is intentional and conscious are analysed by Dewalque and Gauvry along the sides of a triangle having such notions as vertexes. Indeed, taking the mental to be bi-dimensional, that is, constituted both by intentionality and by consciousness, is a thesis that traces back to early phenomenology. According to Brentano, for something to be mental is for it to be intentional, showing the characters of directedness and aboutness. Husserl, however, had already called into question this view, claiming that there are at least some affective states that, despite being mental, are devoid of intentionality. Such original disagreement on the alleged identity between what is mental and what is intentional, is the symptom of another, more general one, that is: how can we class mental states and distinguish them from one another? Needless to say, this issue is still much debated among representationalist philosophers, called to take a stance on the legitimacy of the distinction between the content of mental states (what they are about) and their qualitative phenomenal character (19). The second side of the triangle corresponds to the question whether consciousness is coextensive to the mental. Given that the word “consciousness” is employed in several different ways to indicate different states and properties, the concern is whether for a state to be mental, is for it to be conscious, or rather there exist mental states that need not be conscious (in one of the many senses of the word). All these issues are to be considered in light of the wider theoretical aim to put forward a complete and unified theory of human consciousness. On the one hand, the need for completeness has to do with accounting at once for all the alleged components of human consciousness, while, on the other, aiming at unification implies providing a theory that is both descriptively and explanatorily satisfying. But, as the editors suggest, it seems that philosophers face a sort of dilemma when trying to fulfil both requirements: if mind is bi-dimensional in the just sketched sense, then a complete theory of the mental implies accounting both for its intentional and its conscious component. In case the two notions were not coextensive, this obviously would turn out to be problematic. On the ‘flipside’, a unified theory of mind should be either a theory of consciousness or a theory of intentionality, preventing it from being complete (25). Representationalist theories of mind can be conceived as successful attempts to face this challenge. Indeed, rather than focusing on the two distinct axes: mental-intentional and mental-conscious, representationalism develops along the third side of the triangle, that is the one having as its vertexes, consciousness and intentionality. The main concern becomes finding a way to either ground consciousness in intentionality or, conversely, to ground intentionality in consciousness. Representationalist theories and theories of phenomenal intentionality (or phenomenal intentionalism) are the headings of the two groups of theories trying to apply one of the two strategies respectively (this is why representationalism is sometimes referred to as intentionalism). In other words, neither according to the former nor to the latter, a radical separation between intentionality and consciousness is viable. Philosophy should instead look for the relation connecting such components to appropriately describe and consistently explain our mental life (30). – First Order Representationalism (FOR), is well interpreted by the works of Fred Dretske and Michael Tye (namely, the volume contains the translated versions of Dretske’s «The Representational Character of Sense Experience», Ch.1 of Naturalizing the Mind, 1995, and Tye’s «The Intentionality of Feelings and Experiences», Ch. 4 of Ten Problems of Consciousness, 1995). Generally speaking, FOR claims that a mental state is conscious if it represents something. This amounts to say that the phenomenal character of a mental state (the way it is like to undergo it) is exhausted by its content. Accordingly, what identifies a mental state and distinguishes it from other mental states is precisely what is presented in its content. More precisely, according to both Dretske and Tye, a representational relation consists in the causal co-variation involving a representation and its content: if the content varies, then also what represents such content changes. Despite being evocative and able to capture a fundamental aspect of representational relations, this view requires further refinements. In fact, it is not always simple to individuate the relevant causal relations within a chain. Dretske replies that this difficulty of claiming that which actually fixes the content of a mental state is the function of such a state within the system of the organism. Subsequently, a mental state consists in an informational content plus a certain causal or functional role. The main argument in favour of this view is the well known “argument from transparency”, which insists on the fact that every descriptive effort concerning our experience leads nowhere but to the properties of its content. In a certain sense, we look through our experience, which presents us its objects as a transparent medium. In their sum up to the most relevant and influential representationalist theories, the editors of this volume do not neglect an important consequence of what has been also called strong representationalism: accounting for experiences in terms of their intentional content paves the way to naturalistic reductionism insofar as it allows for a reduction of the properties instantiated by experience to causally connected natural properties. This consequence clearly applies less straightforwardly to weaker versions of representationalism, that hold the phenomenal character to supervene on the representational (or intentional) content. Finally, one of the main and most controversial issues of strong representationalism (reducing the phenomenal character of experiences to their intentional content) concerns the typical case of moods and the analogous affective states that seem quite far from being directed towards something (see 36 and Tye’s essay, 97-133). – Higher Order Representationalism (HOR) is the approach that can be attributed to philosophers like David Rosenthal, Peter Carruthers, Rocco Gennaro, and William Lycan. The volume contains both a translation of Rosenthal’s «Explaining Consciousness» (belonging to the collection edited by David Chalmers Philosophy of Mind. Classical and Contemporary Readings, 2002) and the one of Carruthers’s «HOP over FOR, HOT theory» (Ch.4 of his Consciousness. Essays from a higher-order perspective, 2005). Such thinkers generally believe that FOR does not account for the possibility to represent P without being aware to represent P. Thus, supporters of HOR claim that there must be something more that characterizes conscious mental states, distinguishing them from non-conscious ones. Their view implies the existence of second order intentional states, having as their intentional content, other – per se non conscious – intentional states. Armstrong and Lycan characterise such second order states as Higher Order Perceptions capable of providing information about our (first order) mental states (39). On the contrary, Rosenthal famously claimed that Higher Order Thoughts characterise our conscious states (his notorious argument against the perceptual view is nicely presented in the Introduction (39-40). Alternatively, one may endorse, with Carruthers, a dispositional view, according to which conscious states are those mental states that are available as contents for a second order thought (40 and his paper, 171-197). – Self-Representationalism is represented in the collection by two works: the first is Uriah Kriegel’s «The Self-Representational Theory of Consciousness» Ch. 1 of his Subjective Consciousness. A Self-Representational Theory (2009), while the second is «Consciousness and Intentionality» by George Graham, Terence Horgan and John Tienson (originally included in The Blackwell Companion to Consciousness, 2007). Self-Representationalism holds against HOR that the awareness we have to have in a certain mental state comes immediately with such mental states, and it is not a matter of higher order representations (42). Conscious states are at the same time representing and represented by themselves. More importantly, Self-Representationalism is a clear variant of phenomenal intentionalism inasmuch as it values the phenomenal character of experience as being the ineludible starting point of any theory of mental states. Needless to say, such a perspective refers to the phenomenological tradition that standard representationalism had originally taken as its target. – Naïf Realism is instead radically critical towards representationalist theories of mind. John Hinton, Bill Brewer and Mike Martin share the view that perceiving the world means being in direct contact with it and, at the same time, being conscious of its independence from our experiences. Naïf or empirical (the reference to Berkeleyan empiricism is explicit) realists argue against representationalism and theories of content, that they cannot account for the phenomenal character of our perceptual experiences and that they rely on false presuppositions. Namely, the representationalist’s reference to content implies that every experience is evaluable in terms of truth values, and this – according for instance to Brewer’s translated paper «Perception and Content» (European Journal of Philosophy, 2006) – is both phenomenally and epistemologically unacceptable, while additionally misinterpreting the singularity that is essential to each perceptual experience (52). – Concluding the section dedicated to critical perspectives is the paper which exemplifies Contextualism. In his «Is Seeing Intentional?» (published in Perception. Essays after Frege, 2013) Charles Travis not only rejects the notion of content, but also the view that perception is a relation between a subject who represents the world as being in a certain way, and the content of such representation. Contextualism considers this view radically misleading, insofar as it takes perceptions to be evaluations about the world, just like judgements are. Instead, supporters of contextualism, mostly relying on philosophy of ordinary language, claim that our perception is always situated within a network of relationships most of which are conventional. This should prevent philosophy of mind from reducing perceptions to relations between subjects and (allegedly physically reducible) contents.